The glorious day that all desert racers have been waiting for finally arrived as the 2019 Dakar Rally got started today. All the months of preparation were put into practice on the dunes around Pisco as stage one as the world’s toughest rally got underway. 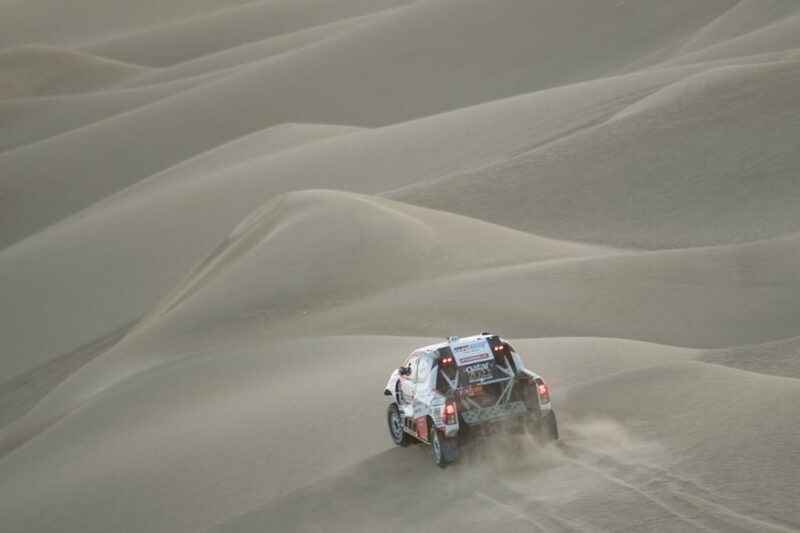 The opening special stage took place after a 247-kilometre liaison route brought the Dakar convoy from Lima to Pisco – then it was 84 kilometres against the clock in the dunes. The journey south along Peru’s Pacific Ocean coastline was clearly enough to bring the best out of the rally’s serious competitors. Watch a brand new episode of Dakar Daily on Red Bull TV right now. Nasser Al-Attiyah (QAT) wasted no time reminding everyone about his sand racing credentials as his Toyota Hilux flew out of the traps in Pisco. The two-time Dakar winner and his co-driver Mathieu Baumel (FRA) were two minutes quicker over the dunes compared with the second placed crew of Carlos Sainz (ESP) and co-driver Lucas Cruz (ESP) in the MINI John Cooper Works Buggy. 2018 FIA Cross Country Rally World Cup winner Kuba Przygonski (POL) completed the stage one car race podium in third place. Further familiar names such as Giniel de Villiers (ZAF), Stéphane Peterhansel (FRA) and Cyril Despres (FRA) could also be found in the Top 10 on stage one. Sébastien Loeb (FRA) sits in 13th place overall after the first day of competition. Get stuck into the dunes with our Dakar vlog right here. The bikers were quick to open the throttle on the opening stage of the 41st Dakar Rally. Honda rider Joan Barreda (ESP) blasted his way over the dunes to collect the 17th stage win of his Dakar career. While Barreda holds the early lead, he was joined in the Top 10 by Red Bull KTM Factory Team riders Sam Sunderland (GBR), Toby Price (AUS) and Matthias Walkner (AUT). A little further back, but still inside the bike race Top 20 after stage one we find; Luciano Benavides (ARG), Stefan Svitko (SLO), CS Santosh (IND) plus Daniel and Walter Nosiglia (BOL). Laia Sanz (ESP) is the top placed female rider in 31st place. There were successful debuts in the SxS/UTV class for Chaleco Lopez (CHI) and Ignacio Casale (CHI). The Chilean pair both ran at the very front of the race on day one with Lopez finishing the stage with the second fastest time. Casale wasn’t too far behind as he finished fourth on stage one. It was a strong start to the latest Dakar for defending truck race champion Eduard Nikolaev (RUS). The Russian trucker is chasing his fourth Dakar truck win as a driver for Team Kamaz Master. Nikolaev’s stage win on the opening day of competition is the best possible start, but he’ll be wary that the Iveco trucks of Ton Van Genugten (NDL), Federico Villagra (ARG) and Gerard De Rooy (NDL) were all able to stay in touch. Tomorrow’s second stage steps things up in terms of distance and difficultly. The convoy is off to San Juan de Marcona and to get there they need to complete 350 kilometres of racing against the clock. Expect a fair amount of drama in the dunes on Tuesday as the cars lead off and are forced to make the first tracks in the sand.